Slipping the cassette into the SDAT, Asuka snapped the lid into place. Picking up its' former occupant, she examined it with a mild disdain. "Hmmph!" She hmmphed. "This dipwad has no real taste in music at all. Kyu Sakamoto? I swear ... These Japanese have no idea what real music is like. Leaving his room, the redhead sat at the kitchen table and started leafing through the magazine thereon. Smiling to herself, thinking of the fun soon to be had. She found the old cassette in a box full of them at a thrift shop toward the outskirts of Tokyo 3. A second thought wouldn't have been given if one of them hadn't grabbed her attention. Her quick blue eyes caught a glimpse of the label. Snapping it up, she gave it a quick once over. German songs? Yes ... The songs were in German all right. Of a kind not exactly fun, party music. A reminder of home albeit a quite negative one. On her first hmmph of the day she was about to put it back when an idea for pranking lit up her mind. "Why not? Be an 'interesting' change from that krap he zones out to on that relic of his! Be interesting to see what his reaction would be." Looking at the kitchen clock Asuka noted the time. "About due back from those synch tests. Any minute and-"
"Quiet dork brain! Misato's still sleeping. She's on duty tonight y'know." "Right!" Shinji whispered, noting a groan coming from Misatos' room. Having already showered at NERV test labs, Ikari headed toward his room. "Okay," Asuka 'revving' up. "Three ... two ... one ... Cue the angry mob ... "
Of course it took a bit longer than that and was worth the wait. Stomping out of his room, SDAT in hand, through the hall and living room to find a giggling Asuka hiding her face in the magazine. 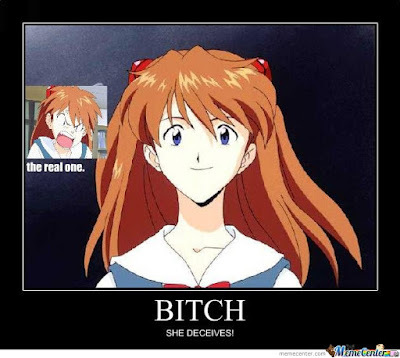 "Y'know Asuka? I've often wondered about you," Shinji holding up the tape player, "and this pretty much confirms my suspicions." "Y'know what I mean ... Sadisma-chan ... your manner, the way you act toward me when no one else is around. The way you-"
The magazine hit the table with a resounding slap. "I beg your VERY inadequate pardon!" "I mean ... You're German, right?" "I'm also Japanese!" Rising from the table, blue eyes flashing. "Just what are you not so subtly implying?! Just what-"
"HOLD IT! ... RIGHT THERE!" Clad in characteristic skimpy cut-offs, the now harbinger of death that was Misato stood framed in the kitchen doorway. Lopsided leer/smile in contrast to downturned eyebrows. "Oh ... Misato," greeted Shinji, embarrassed look. "You're up early, I mean-"
"Damn straight I'm up early. Who needs an alarm clock when-"
"These older folks so do need their sleep Shinji," explained the redhead in mock seriousness. "Can it, you! All right ... kiddies! Just what is it this time. Just WHAT i-," cut off by herself in mid utterance, the Operations Chiefs' eyes on what Shinji held, she hissed, " ... Esss ... DAT!" "Ist dass ... er ... DAT ein S Dat?" Asuka laughing. "Oh ja!" "Uh ... erm ... " Not finding words, Ikari started lowering his arms as a prelude to hiding the player behind his back. "Oh no ya' don't!" Katsuragi exclaimed grabbing the portable from Shinjis' grasp. "Let's see ... uh ... hear what's on this thing now." The young man, eyes rolling, stared up at the ceiling as Misato popped the ear buds in, a smirking Asuka looking on. "Let's see what she makes of that," thought the redhead as the major hit rewind, backing the tape up a few inches. "Heyyy! This isn't so bad." Both the youngsters gaped at Misato, then each other, then back at the major. "Kinda' military, right? I could march to this!" She proclaimed stepping in place. "Don't know a lick of German but this sounds goood." "You don't know!?" Both teens in unison. "Know what?" Questioned Misato removing the ear buds. "We just went over that in history class last week," Shinji started to explain. "You'd think she'd know ... ," Asuka grinning from the safety of the tables' far side. "... considering how OLD she is." Slowly Katsuragi turned, step by step, inch by inch. "Watch it, kid!" Misato ominously warned, plucking out the earbuds. "I may have been born when cassettes were still going strong but that doesn't make me old! I'm only TWENTY NINE fer cryin' out loud!" Instantly calming, the major paused, putting on a big grin toward Asuka. "Hmmph!" Arms now crossed, Asuka hmmphed her umpteenth hmmph of the day. "So just what is it about this I should know?" "Uh ... have a seat Misato," Shinji invited. The lyrics are from the first and fourth verses of the Horst Wessel Song, the anthem of the National Socialist German Workers Party, aka the NAZI Party. 1. Ue o Muite Arukōu (namida ga kobore nai you ni) - (1963) - I Will Walk Looking Up (so the tears won't fall). Sung by Kyu Sakamoto. Lyrics by Rokusuke Ei and music by Hachidai Nakamura. Americans "renamed" the song Sukiyaki as it was easier to associate even though the food hasn't a thing to do with the song. This song figures greatly in the Studio Ghibli anime film, From Up on Poppy Hill. You Tube link for song and still scenes of From Up On Poppy Hill here. Go to C V Fords' profile and anime fanfiction page on fanfiction dot net here. I have "Sukiyaki" on my player! Vocal AND instrumental. I remember it from a child!